Little Rhumbi Rhino wakes up in a strange place. All alone and in pain, Rhumbi cries out for her mummy. This is a unique story about an endangered little rhino called Rhumbi, who by telling her story asks children around the world to ‘hear her cry and be her voice’ in raising awareness about rhino poaching. Children and parents will love and enjoy this book. The character is loveable and definitely one to make an impression, the story reflects on current news reflected in social media and contains interesting rhino facts in bold print on each page surrounding the events of the story- making the book not only realistic and enlightening, but also very educational. In the story, Rhumbi wakes up in a wildlife orphanage after losing her mum as well as her own little horn in a brutal poaching attack. Sadly, Rhumbi starts to remember the horrible ordeal when poachers attacked her mum. This story reflects on many similar poaching attacks on rhinos. Rhumbi Rhino is published by Jelly Bean Books. £1 from the sale of every book will be donated to Save The Rhino International. See their mission statement and find out how you can help here. Alka-Lea Margerison lives in Essex with her family, but grew up in Zimbabwe with wildlife on her doorstep. Her astonishing childhood is filled with memories of giraffe, antelope, zebra, cheetah, elephant and rhino. She graduated from the London Montessori Centre with an International Montessori Teacher Diploma and began her teaching career. Alka-Lea has been teaching in schools in England and Zimbabwe for the last two decades. Alka-Lea has watched how children naturally desire to love and care for their environment and wildlife. 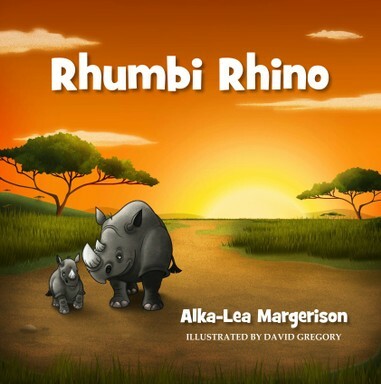 With this in mind, along with her love for rhinos, has led her to write this book, Rhumbi Rhino, to help children know more about the rhino poaching crisis, and hopefully encourage them to get involved in supporting rhino conservation.